Thymidylate synthetase (EC 2.1.1.45) is an enzyme that catalyzes the conversion of deoxyuridine monophosphate (dUMP) to deoxythymidine monophosphate (dTMP). Thymidine is one of the nucleotides in DNA. With inhibition of TS, an imbalance of deoxynucleotides and increased levels of dUMP arise. Both cause DNA damage. By means of reductive methylation, deoxyuridine monophosphate (dUMP) and N5,N10-methylene tetrahydrofolate are together used to form dTMP, yielding dihydrofolate as a secondary product. This provides the sole de novo pathway for production of dTMP and is the only enzyme in folate metabolism in which the 5,10-methylenetetrahydrofolate is oxidised during one-carbon transfer. The enzyme is essential for regulating the balanced supply of the 4 DNA precursors in normal DNA replication: defects in the enzyme activity affecting the regulation process cause various biological and genetic abnormalities, such as thymineless death. The enzyme is an important target for certain chemotherapeutic drugs. Thymidylate synthase is an enzyme of about 30 to 35 kDa in most species except in protozoan and plants where it exists as a bifunctional enzyme that includes a dihydrofolate reductase domain. A cysteine residue is involved in the catalytic mechanism (it covalently binds the 5,6-dihydro-dUMP intermediate). The sequence around the active site of this enzyme is conserved from phages to vertebrates. Thymidylate synthase is induced by a transcription factor LSF/TFCP2 and LSF is an oncogene in hepatocellular carcinoma. LSF and Thymidylate synthase plays significant role in Liver Cancer proliferation and progression and Drug resistance. Thymidylate synthase (TS) plays a crucial role in the early stages of DNA biosynthesis. DNA damage or deletion occur on a daily basis as a result of both endogenous and environmental factors. Such environmental factors include ultraviolet damage and cigarette smoke that contain a variety of carcinogens. Therefore, synthesis and insertion of healthy DNA is vital for normal body functions and avoidance of cancerous activity. In addition, inhibition in synthesis of important nucleotides necessary for cell growth is important. For this reason, TS has become an important target for cancer treatment by means of chemotherapy. The sensitivity of TS to succumb to TS inhibitors is a key part to its success as treatment for colorectal, pancreatic, ovarian, gastric, and breast cancers. The use of TS inhibitors has become a main focus of using TS as a drug target. The most widely used inhibitor is 5-fluorouracil (5-FU), which acts as an antimetabolite that irreversibly inhibits TS by competitive binding. However, due to a low level of 5-FU found in many patients, it has been discovered that in combination with leucovorin (LV), 5-FU has greater success in down regulating tumor progression mechanisms and increasing immune system activity. Experimentally, it has been shown that low levels of TS expression leads to a better response to 5-FU and higher success rates and survival of colon and liver cancer patients. However, additional experiments have merely stated that levels of TS may be associated with stage of disease, cell proliferation and tumor differentiation for those with lung adenocarcinoma but low levels are not necessarily indicators of high success. Expression levels of TS mRNA may be helpful in predicting the malignant potential of certain cancerous cells, thus improving cancer treatment targets and yielding higher survival rates among cancer patients [Hashimoto]. TS’s relation to the cell cycle also contributes to its use in cancer treatment. Several cell-cycle dependent kinases and transcription factors influence TS levels in the cell cycle that increase its activity during the S phase but decrease its activity while cells are no longer proliferating. In an auto-regulatory manner, TS not only controls its own translation but that of other proteins such as p53 that through mutation is the root of much tumor growth. Through its translation, TS has a varying expression in cancer cells and tumors, which leads to early cell death. In the proposed mechanism, TS forms a covalent bond to the substrate dUMP through a 1,4-addition involving a cysteine nucleophile. The coenzyme tetrahydrofolate donates a methyl group to the alpha carbon while reducing the new methyl on dUMP to form dTMP. This shows the intricate interactions of the UMP in the active site of thymidylate synthase. It has been proven that the imine formed through reaction with THF and dUMP is an intermediate in the reaction with dUMP through mutations in the structure of TS that inhibit the completion of the mechanism. V316Am TS, a mutant with deletion of C terminal valines from both subunits, allows the catalysis of dehalogenation of BrdUMP preceding the mechanism described above and the covalent bond to THF and dUMP. The mutant TS is unable to accomplish the C-terminal conformational change needed to break covalent bonds to form dTMP, thus showing the proposed mechanism to be true. The structure was deduced through x-ray crystallography of V316Am TS to illustrate full homodimer TS structure (Figure 1). In addition, it showed possible interactions of the 175Arg and 174Arg between dimers. These arginines are thought to stabilize the UMP structures within the active sites by creating hydrogen bonds to the phosphate group (Figure 2). [Stroud and Finer-Moore] 5-FU is an inhibitor of TS. Upon entering the cell, 5-fluorouracil (5-FU) is converted to a variety of active metabolites, intracellularly. One such metabolite is FdUMP which differs from dUMP by a fluorine in place of a hydrogen on the alpha carbon. FdUMP is able to inhibit TS by binding to the nucleotide-binding site of dUMP. This competitive binding inhibits the normal function of dTMP synthesis from dUMP [Longley]. Thus the dUMP is unable to have an elimination reaction and complete the methyl donation from THF. Figure 1. This figure depicts the homodimer that is TS. As you can see the orange and teal backbones never connect or intertwine, but there are side chains interactions between the dimers. On the orange protein, you can visibly detect two long side chains that enter the teal protein (this is located within the yellow circle). The other beige parts are side chains that interact within the active site. Just below the yellow circle, you are able to see the same pattern of side chains and configuration. Figure 2. This figure shows the possible H-bond interactions between the arginines and the UMP in the active site of thymidylate synthase. This can be seen by the faint lines between the blue tips and the red tips. These arginines are used to hold the position of the UMP molecule so that the interaction may occur correctly. The two arginines in the top right corner that are located next to each other on the back bone are actually from the other protein of this dimer enzyme. This interaction is one of the many intermolecular forces that holds these two tertiary structures together. The yellow stand in the top-middle region shows a sulfur bond that forms between a cysteine side chain and UMP. This covalently holds the UMP within the active site until it is reacted to yield TMP. ^ "Entrez Gene: TYMS thymidylate synthetase". ^ "DNA: Form and Function" (PDF). ^ a b Stroud RM, Santi DV, Hardy LW, Montfort WR, Jones MO, Finer-Moore JS (1987). "Atomic structure of thymidylate synthase: target for rational drug design". Science. 235 (4787): 448–455. doi:10.1126/science.3099389. PMID 3099389. ^ Gotoh O, Shimizu K, Kaneda S, Nalbantoglu J, Takeishi K, Seno T, Ayusawa D (1990). "Structural and functional analysis of the human thymidylate synthase gene". J. Biol. Chem. 265 (33): 20277–20284. PMID 2243092. ^ Santhekadur PK, Rajasekaran D, Siddiq A, Gredler R, Chen D, Schaus SE, Hansen U, Fisher PB, Sarkar D (2012). "The transcription factor LSF: a novel oncogene for hepatocellular carcinoma" (PDF). Am J Cancer Res. 2 (3): 269–85. PMC 3365805  . PMID 22679558. ^ a b c d Peters GJ, Backus HH, Freemantle S, van Triest B, Codacci-Pisanelli G, van der Wilt CL, Smid K, Lunec J, Calvert AH, Marsh S, McLeod HL, Bloemena E, Meijer S, Jansen G, van Groeningen CJ, Pinedo HM (2002). "Induction of thymidylate synthase as a 5-fluorouracil resistance mechanism". Biochim. Biophys. Acta. 1587 (2–3): 194–205. doi:10.1016/S0925-4439(02)00082-0. PMID 12084461. ^ "Leucovorin". MedlinePlus Drug Information. U.S. National Library of Medicine. ^ Papamichael D (2000). "The Use of Thymidylate Synthase Inhibitors in the Treatment of Advanced Colorectal Cancer: Current Status". NCBI. 4 (6): 478–87. PMID 10631692. ^ a b Papamichael D (1999). "The use of thymidylate synthase inhibitors in the treatment of advanced colorectal cancer: current status". Oncologist. 4 (6): 478–87. PMID 10631692. ^ Nicolini A, Conte M, Rossi G, Ferrari P, Duffy M, Barak V, Carpi A, Miccoli P (2011). "Additional 5-FU-LV significantly increases survival in gastrointestinal cancer". Front Biosci. 3: 1475–82. doi:10.2741/348. PMID 21622151. ^ Carreras CW, Santi DV (1995). "The catalytic mechanism and structure of thymidylate synthase". Annu. Rev. Biochem. 64: 721–62. doi:10.1146/annurev.bi.64.070195.003445. PMID 7574499. Carreras CW, Santi DV (1995). "The Catalytic Mechanism and Structure of Thymidylate Synthase". Annual Review of Biochemistry. 64 (1): 721–762. doi:10.1146/annurev.bi.64.070195.003445. PMID 7574499. Banerjee D, Mayer-Kuckuk P, Capiaux G, et al. (2002). "Novel aspects of resistance to drugs targeted to dihydrofolate reductase and thymidylate synthase". Biochim. Biophys. Acta. 1587 (2–3): 164–73. doi:10.1016/S0925-4439(02)00079-0. PMID 12084458. Liu J, Schmitz JC, Lin X, et al. (2002). "Thymidylate synthase as a translational regulator of cellular gene expression". Biochim. Biophys. Acta. 1587 (2–3): 174–82. doi:10.1016/s0925-4439(02)00080-7. PMID 12084459. Chu J, Dolnick BJ (2002). "Natural antisense (rTSalpha) RNA induces site-specific cleavage of thymidylate synthase mRNA". Biochim. Biophys. Acta. 1587 (2–3): 183–93. doi:10.1016/s0925-4439(02)00081-9. PMID 12084460. Peters GJ, Backus HH, Freemantle S, et al. (2002). "Induction of thymidylate synthase as a 5-fluorouracil resistance mechanism". Biochim. Biophys. Acta. 1587 (2–3): 194–205. doi:10.1016/S0925-4439(02)00082-0. PMID 12084461. Costi MP, Tondi D, Rinaldi M, et al. (2002). "Structure-based studies on species-specific inhibition of thymidylate synthase". Biochim. Biophys. Acta. 1587 (2–3): 206–14. doi:10.1016/s0925-4439(02)00083-2. PMID 12084462. Lin D, Li H, Tan W, et al. (2007). "Genetic polymorphisms in folate- metabolizing enzymes and risk of gastroesophageal cancers: a potential nutrient-gene interaction in cancer development". Forum of nutrition. Forum of Nutrition. 60: 140–5. doi:10.1159/000107090. ISBN 3-8055-8216-1. PMID 17684410. This is a family of proteins that are flavin-dependent thymidylate synthases. 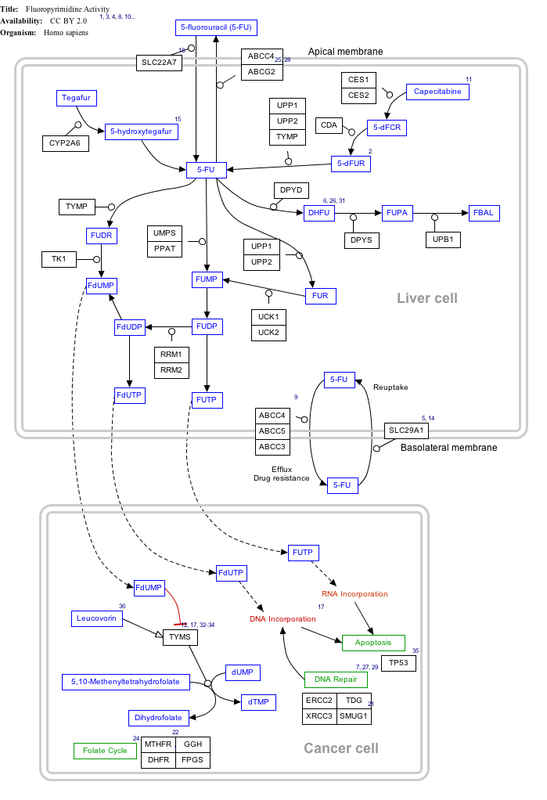 Thymidylate synthase (EC) [PUBMED:6996564, PUBMED:2117882] catalyzes the reductive methylation of dUMP to dTMP with concomitant conversion of 5,10-methylenetetrahydrofolate to dihydrofolate: 5,10-methylenetetrahydrofolate + dUMP = dihydrofolate + dTMP This provides the sole de novo pathway for production of dTMP and is the only enzyme in folate metabolism in which the 5,10-methylenetetrahydrofolate is oxidised during one-carbon transfer [PUBMED:3099389]. The enzyme is essential for regulating the balanced supply of the 4 DNA precursors in normal DNA replication: defects in the enzyme activity affecting the regulation process cause various biological and genetic abnormalities, such as thymineless death [PUBMED:2243092]. The enzyme is an important target for certain chemotherapeutic drugs. Thymidylate synthase is an enzyme of about 30 to 35 Kd in most species except in protozoan and plants where it exists as a bifunctional enzyme that includes a dihydrofolate reductase domain [PUBMED:3099389]. A cysteine residue is involved in the catalytic mechanism (it covalently binds the 5,6-dihydro-dUMP intermediate) [PUBMED:16615077,PUBMED:7574499]. The sequence around the active site of this enzyme is conserved from phages to vertebrates. Thymidylate synthase also acts as a regulator of its own expression by binding and inactivating its own RNA. Due to its key role in the de novo pathway for thymidylate synthesis and, hence, DNA synthesis, it is one of the most conserved enzymes across species and phyla [PUBMED:16162288,PUBMED:16511011]. Thymidylate synthase is a well-recognized target for anticancer chemotherapy, as well as a valuable new target against infectious diseases [PUBMED:16178783]. Interestingly, in several protozoa, a single polypeptide chain codes for both dihydrofolate reductase (DHFR) and thymidylate synthase (TS), forming a bifunctional enzyme (DHFR-TS), possibly through gene fusion at a single evolutionary point. DHFR-TS is also active as a dimer [PUBMED:14555647]. This entry also includes dUMP hydroxymethylases and dCMP hydroxymethyltransferases from bacteriophages. dCMP-HMase catalyzes the reversible conversion of dCMP and CH2THF to hydroxymethyl-dCMP and THF. dUMP hydroxymethylase is encoded by several bacteriophages that infect Bacillus subtilis and contain hydroxymethyl-dUMP instead of dTMP in their DNA, for their own protection against the host restriction system [PUBMED:10064578]. dCMP hydroxymethyltransferase has a subunit fold and a dimerization pattern in common with thymidylate synthases [PUBMED:10064578]. For those sequences which have a structure in the Protein DataBank, we use the mapping between UniProt, PDB and Pfam coordinate systems from the PDBe group, to allow us to map Pfam domains onto UniProt sequences and three-dimensional protein structures. The table below shows the structures on which the Thymidylat_synt domain has been found. There are 567 instances of this domain found in the PDB. Note that there may be multiple copies of the domain in a single PDB structure, since many structures contain multiple copies of the same protein sequence.